Open Objects... has moved: Can ugly babies save museums? 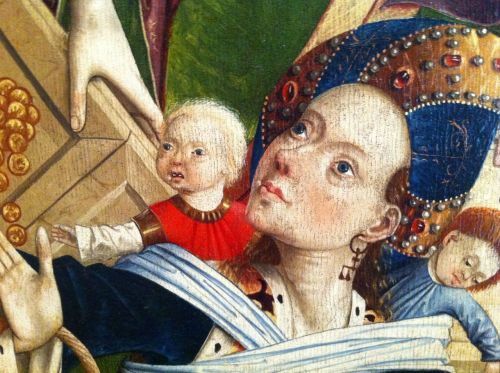 Since coming across Ugly Renaissance Babies, I've been wondering: is Tumblr* the best thing to happen to broad public engagement with art history**? They're dead simple posts - an image and a short comment, but they spread widely (as you can see from the number of re-posts), and arguably make renaissance art more interesting to people who wouldn't normally view it. Can sites that curate content from across different collections like this create serendipity through decontextualisation, and bring art history to the masses? Like image macros, they can bring history and popular culture together in amusing ways (e.g. Joseph Ducreux, the Bayeux Tapestry and song lyrics), but is this irreverent commentary and re-contextualisation exactly the kind of thing that skeptical curators worried about when we were all getting excited about online collections? So I also have an entirely different question - does it matter to museums, galleries if (like the V&A) your painting appears in Ugly Renaissance Babies? Is it ok to point out 'bad' art like this? Visitors often make rude comments about the ugly babies or whatever as they pass through museum galleries, but unless someone is there to hear them their comments are ephemeral. Finally, since this is presumably my last post for the year, I'd like to thank you for reading and commenting, and for inspiring conversations at conferences and on twitter - may your 2012 bring wondrous things to you and yours. ** I suspect artistic objects are more 'portable' than social history or science objects, as they make visual sense without a story explaining what they are or why they're important. Thanks for an excellent blog post! I agree wee do need to think twice about our "museum ways of looking at our collections". Very inspiring. :-) Happy New 2012! Absolutely brilliant post! Anything that can make the work more accessible and relevant is to be embraced, I think, and your point about the onward reach of people re-posting Tumblr content is well-made.